quiznos finally has food for vegans! for a long time, quiznos has been a place for vegans to avoid. up until very recently, all of their breads have contained dairy, making it impossible to order a vegan sandwich. all this has changed though, with the introduction of the torpedo! the new sleek sandwich is over one foot long, about two inches wide, and comes on baked ciabatta bread that is delicious and dairy-free. 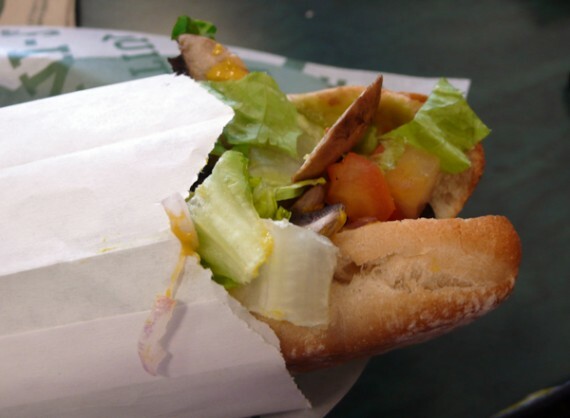 although none of the standard torpedo combinations are vegan (or even vegetarian), you can order a vegan sandwich by getting a torpedo with the the veggie sub fillings, minus the cheese and vinaigrette (which contains dairy). the end result is actually extremely tasty, and a damn good deal for 4 bucks. plus, isn’t it great to know we vegans can finally eat at quiznos?!?! i am sooo burnt out on subway. oh, and you get extra credit vegan points if you bring in your own tofurky and add it to your sandwich. it really takes the torpedo to the next level. so there you have it. vegan fast food for under 5 dollars. if you are ever stranded in need of a vegan meal, chances are you are probably near a quiznos. do the torpedo! oh, and in case you were wondering…my friend double checked with the quiznos hq about the torpedo bread being vegan, and they sent her a list of ingredients in the ciabatta. click here if you want to check them out.